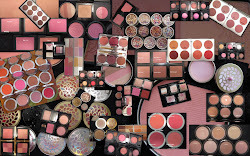 Blushes on Display: Happy Holidays!! devoted solely to the beauty of blush. Just a quick note to say I'm still here. I hope you're all doing well! My passion for blush seems to have faded a bit. I've been a little overwhelmed with some non-makeup related things. Hopefully after the holidays my blush love will be reignited! I just wanted to say that I'm having a blog sale if you're interested in some new goodies and have any money left after all the Christmas shopping. So check it out if you're interested (I'm parting with some treasures). Have a great Christmas and a wonderful New Year! Hope to see you more next year. PEACE. How To Use a Nose Hair Trimmer Properly - This is the excerpt for your very first post. Blush addict!!! Unless otherwise stated, everything on this blog is from my own collection. They have been acquired from buying or swapping through conventional means.